It’s no secret that student loan debt in the U.S. is staggering. According to the student debt website Student Loan Hero, over 44 million borrowers owe a grand total of $1.4 trillion on student loans. The average student debt load for the Class of 2016 was $37,172. This is $620 billion more than the total amount of credit card debt in the U.S. 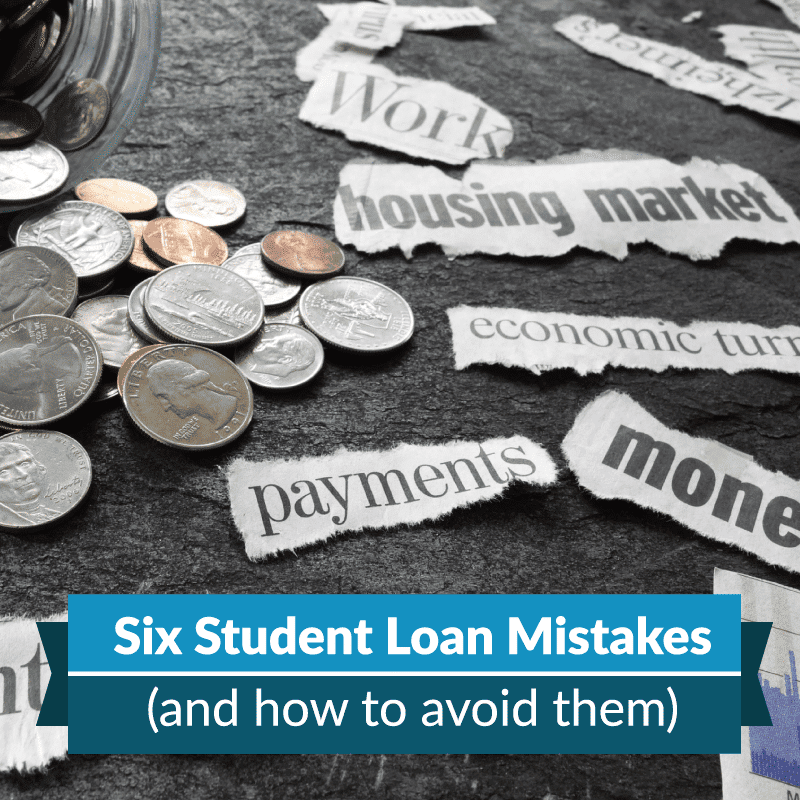 In light of those jaw-dropping numbers, if you’re in college or a recent graduate you’ll want to do all you can to avoid piling on student debt. The less you owe upon graduation, the easier it’ll be for you to focus on your short and long-term financial goals. When Jacob Brad Johnson was an undergraduate, he turned down a presidential scholarship. On top of that, after his first year of college, he neglected to renew a scholarship that would’ve covered half his tuition. Investigate as many sources of funding for higher education as possible. For starters, submit a FAFSA, the Free Application for Federal Student Aid. That will help you discover what kinds of student financial aid you’re eligible for, including grants, scholarships, work-study awards, and loans. If you don’t submit a FAFSA you won’t be eligible for any of the aforementioned aid. You will be limited instead to the private loans and scholarships you can find on your own. Ways to search for college scholarships include looking into scholarships affiliated with religious and community organizations, through your parents’ employers, or on the U.S. Department of Labor’s free scholarship finder tool. When Dr. Julie Gurner completed graduate school, she signed up for Income-Based Repayments, wherein the amount you pay each month depends on your income and the size of your household. So when you earn more or your household decreases in size, your monthly payment goes up. This can be advantageous when you are early in your career and not earning much, or if you’re supporting a family while paying back your loans. Research the repayment options available to you, but also pay as much as you can afford instead of settling on the lowest monthly payment amount you can get. Besides Income-Based Repayment (IBR), there is also the Standardized Repayment Plan which has fixed payments for 10 years for unconsolidated loans, and for anywhere from 10 to 30 years for consolidated loans. The 10-year repayment plan could be tougher to manage in the short term, with higher monthly payments, but could save you thousands of dollars in interest by getting you out of debt faster. You may also be eligible for Student Loan Forgiveness, which means that any balance owed on your student after 10 years of payments can be forgiven if you’ve spent that time working in public service, such as for a qualified government agency or non-profit. ​When Maggie McCombs graduated from college, she had managed to save $2,000 and threw the entire amount toward the entire loan. She received a notice that her loan was paid a month ahead, and as a result, she wouldn’t owe anything in the next month. While there’s no penalty for making additional or early payments on your student loans, McCombs made a fatal error. She mistakenly believed she didn’t have to make payments for nearly a year. She inadvertently racked up nearly $1,000 in late fees. Any time you skip one or more payments because you are in a grace period, you paid ahead or you requested a deferment or forbearance, be extra sure that you understand the terms of doing so, including the date your next payment is due. Get it all in writing. Contact your student loan servicer, which may not be the same as the lender who originally made the loan. Sign up for email notifications. Open all mail from your servicer. McCombs enrolled in automatic payments to ensure she’d never miss another due date. When Andrea Woroch’s college friends were making plans for an epic spring break trip, she was too broke to afford to go. She worked over the summer and on weekends to help pay for tuition and books, but didn’t have any extra spending money. Unfortunately, she came down with a serious case of FOMO (fear of missing out). She used her student loan funds to pay for the trip. “It was completely unnecessary and took me awhile to pay off,” says Woroch. The harsh truth is that you need to decline an expense that you can’t afford. Plan something more in your budget. You probably have friends in the same boat who will join you. Borrowing for a large entertainment expense is an option you can consider when you’ve got a steady paycheck, but it’s never a good idea. Woroch suggests planning trips closer to home. “A road trip to a nearby lake where you can camp will offer you the same memories of spending time with friends without blowing your budget or causing you to go into debt,” she says. Nikki Koontz grew up in Idaho but studied acting at a university in California. She made the mistake of fully funding her four years of out-of-state tuition, including a year abroad, with student loans. Her undergraduate degree cost her $80k. My student loan debt is off-the-charts ridiculous,” says Koontz, who now works in Marketing at the Southern Utah University. While going to an out-of-state school isn’t necessarily a mistake, it can be a regrettable one if you can get the same education for far less money elsewhere, or you don’t take advantage of scholarships and grants. More affordable options include a school in your state, a community college for the first two years, a vocational or trade school, military service, or a private school that offers a significant amount of non-debt aid. Koontz recommends meeting with a financial aid advisor before you take out any loans. You should also hunt around for scholarships and work study opportunities. “There’s a lot of unclaimed money, but you have to be willing to work for it,” says Koontz. ​When Lyn Alden graduated from college, her credit score was over 800. She took out her student loans in 2006 - 2009, when rates hit historic lows. When she graduated, the interest rate on her student loans were at a fixed rate of 6 percent. Her mistake was not refinancing when even lower rates were available. “That little mistake of not taking action when I could’ve cost me thousands of dollars,” says Alden, who is 29 and runs her own investment strategy firm. Consider refinancing your student loans, which can lower your monthly payment and the overall cost of the loan. Even if you don’t have stellar credit score like Alden, you may be able to save money. Getting out from under your student debt burden will free you up to focus on other long-term financial goals. Just remember that the only way to refinance federal loans is with a private loan and in doing so you lose the benefit of federal repayment options, deferment and forbearance. 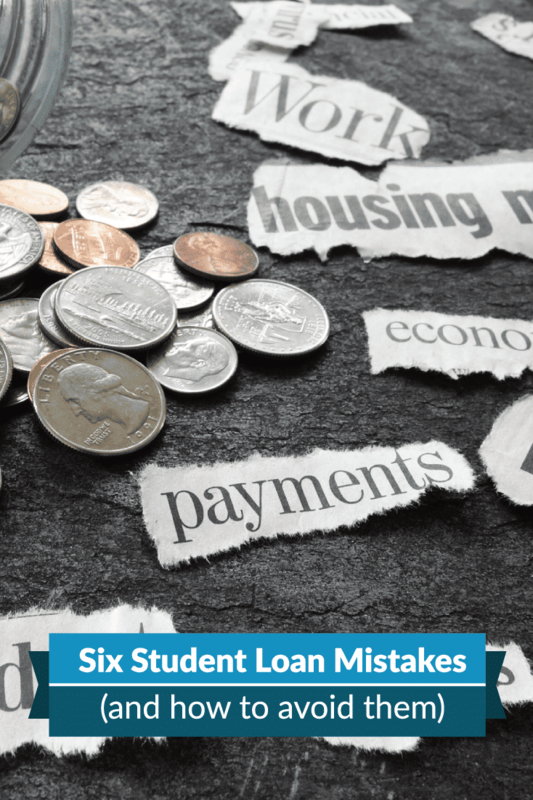 While you may not avoid student loan debt entirely, to prevent yourself from digging a deeper student debt hole than you need to, mind these student debt mistakes. Remember that a little bit of planning and preparation can save you thousands. Have you ever made any of these mistakes before? What did you do to fix it? Investigate as many sources of funding for higher education as possible. For starters, submit a FAFSA, the Free Application for Federal Student Aid. That will help you discover what kinds of student financial aid you’re eligible for, including grants, scholarships, work-study awards, and loans. If you don’t submit a FAFSA you won’t be eligible for any of the aforementioned aid. You will be limited instead to the private loans and scholarships you can find on your own. When Dr. Julie Gurner completed graduate school, she signed up for Income-Based Repayments, wherein the amount you pay each month depends on your income and the size of your household. So when you earn more or your household decreases in size, your monthly payment goes up. This can be advantageous when you are early in your career and not earning much, or if you’re supporting a family while paying back your loans. Research the repayment options available to you, but also pay as much as you can afford instead of settling on the lowest monthly payment amount you can get. Besides Income-Based Repayment (IBR), there is also the Standardized Repayment Plan which has fixed payments for 10 years for unconsolidated loans, and for anywhere from 10 to 30 years for consolidated loans. The 10-year repayment plan could be tougher to manage in the short term, with higher monthly payments, but could save you thousands of dollars in interest by getting you out of debt faster. When Maggie McCombs graduated from college, she had managed to save $2,000 and threw the entire amount toward the entire loan. She received a notice that her loan was paid a month ahead, and as a result, she wouldn’t owe anything in the next month. When Andrea Woroch’s college friends were making plans for an epic spring break trip, she was too broke to afford to go. She worked over the summer and on weekends to help pay for tuition and books, but didn’t have any extra spending money. Unfortunately, she came down with a serious case of FOMO (fear of missing out). She used her student loan funds to pay for the trip. “It was completely unnecessary and took me awhile to pay off,” says Woroch. Nikki Koontz grew up in Idaho but studied acting at a university in California. She made the mistake of fully funding her four years of out-of-state tuition, including a year abroad, with student loans. Her undergraduate degree cost her $80k. My student loan debt is off-the-charts ridiculous,” says Koontz, who now works in Marketing at the Southern Utah University. When Lyn Alden graduated from college, her credit score was over 800. She took out her student loans in 2006 - 2009, when rates hit historic lows. When she graduated, the interest rate on her student loans were at a fixed rate of 6 percent.